We visited the Dutch open air museum in Arnhem. In this museum you can find many houses and buildings, which are collected and preserved since 1912. Two of the many interesting interiors that can be seen. Met de tram. The streetcar. Trough the grounds of the museum, runs a closed track, with 6 stations. Different types of streetcars run continuously, from station to station. You can get it or out, at any station. My granddad was working in a streetcar company before his retirement. He also occasionally guided tourists to Marken and Volendam, while they traveled by streetcars. When I visited Marken with my grandparents and parents about 48 years ago, my granddad was recognized by the famous Sijtje Boes, so we were invited in. The interior of the house in the open air museum, shows how it was. Or do I only remember it like this? 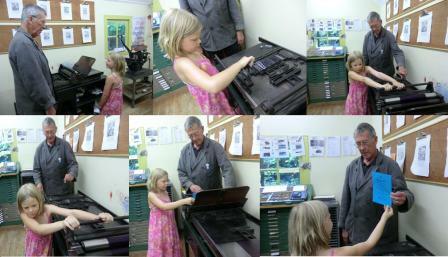 Our granddaugther makes a print in the pressroom. As a CW operator, I immediately noticed, that the most frequent used characters, are in the middle of the box. This reduces the movements, in picking up the characters, during typesetting. By introducing dots and dashes and assigning the shorter code, to the most frequent used characters, mr. Vail increased the speed of the transmissions in Morse code.